Hi there! First I have to explain the title. Ultima Thule usually stands for any place beyond the known world… Actually, we will not leave the Solar System. Ultima Thule is an unofficial nickname for (486958) 2014 MU69, which is the next target of New Horizons spacecraft. 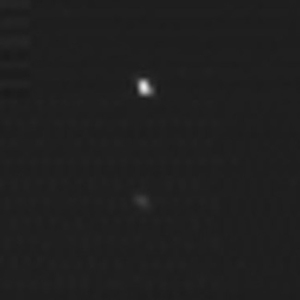 Do you remember this spacecraft, which gave us outstanding images of Pluto and Charon in July 2015? That’s just the same one! After having left Pluto, New Horizons changed its trajectory to 2014 MU69, which will be reached on January 1st, 2019. 6 months to wait then. Interestingly, 2014 MU69 was unknown when New Horizons was launched in January 2006. Its primary mission was the binary Pluto-Charon and its satellites, and of course it was worth to extend the mission to another body. But choosing this second target was a difficult task, since the distant Solar System, here the Kuiper Belt, is very difficult to observe, and is pretty sparse. 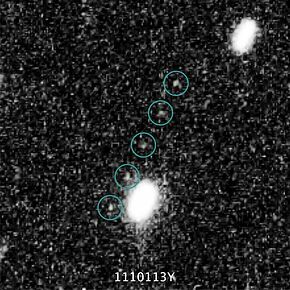 This is why observations programs of the Hubble Space Telescope (HST) were dedicated, and 2014 MU69 has been discovered in 2014. Discovering an object is one thing, determining accurately its motion in view of a rendezvous with a spacecraft is another thing. This is the topic of the study I present today, High-precision orbit fitting and uncertainty analysis of (486958) 2014 MU69, by Simon Porter et al. This study has recently been published in The Astronomical Journal. New Horizons is the first mission of NASA’s New Frontier program. It was launched in January 2006, and made its closest approach to Pluto in July 2015. Before that, it incidentally encountered the small asteroid (132524) APL at a distance of about 100,000 km in June 2006, and benefited from the gravitational assistance of Jupiter in February 2007.
and the Radioscience Experiment (REX), which measured the temperature and the atmospheric pressure of Pluto. As you can see from some of the names of the instrument, Pluto-Charon was definitely the primary goal of New Horizons. Anyway, Pluto is now behind, and New Horizons is en route to 2014 MU69, also nicknamed Ultima Thule. At this time, our knowledge of Ultima Thule is very limited. This body has been discovered in 2014, from a dedicated observation program on the Hubble Space Telescope, to identify potential targets for New Horizons. Finally, 2014 MU69 has been selected, partly for technical reasons, i.e. it is not so difficult to reach from Pluto. It was discovered in June 2014, and has an apparent magnitude of nearly 27, and an absolute one of 11. We can guess its size from its magnitude, and its diameter should be smaller than 50 km. So, a very small body. A stellar occultation happening in 2017 has revealed that its diameter should be closer to 25-30 km, and its shape may be bilobal, or it could even be a contact binary. Observations of its dynamics revealed that it is a cold, classical Kuiper Belt object. Its eccentricity and inclination are limited, since they are not excited by any resonance with the giant planets. So, it belongs to a region of the Solar System, which is quiet from a dynamical point of view. As I previously said, discovering it is not enough if you want a spacecraft to reach it. You must know its motion accurately, and for that you need more data. And Ultima Thule can be observed only with the Hubble Space Telescope. The authors disposed of 5 observations of 2014 MU69, by the Wide Field Camera 3 (WFC3) of the HST. Even with the HST, imaging 2014 MU69 requires 6 minutes of exposure, i.e. you need to accumulate photons reflected by 2014 MU69 during 6 minutes to have enough signal. Another difficulty comes from the number of stars in that region of the sky. This is due to the galactic latitude of 2014 MU69, which is close to 0, i.e. close to the Galactic plane. The images have to be treated, to remove their incoming light. This is not just a pixel, but a diffraction spot, which needs to be modeled to be properly removed. Once you have these data, you can start to determine the orbit of 2014 MU69, i.e. make ephemerides. When you catch a body on a 2-dimensional image of the sky, you get two coordinates. Basically, these coordinates translate into a right ascension, and a declination. And to build ephemerides of a body, you need to integrate the equation ruling the orbital motion. This equations is a second-order 3-dimensional ordinary differential equation. The motion is ruled by the gravitational perturbation of the Sun and the major planets, and for the problem to be solved, you need initial conditions. These are a position and a velocity of 2014 MU69 at a given date, which you derive from your astrometric observations, i.e. the 5 couples (right ascension, declination). Easy, isn’t it? No, it’s not! Because of the uncertainties on the measurements, your 10 data, i.e. 5 right ascensions and 5 declinations, do not exactly correspond to an initial condition. So, you have to make a fit, i.e. determine the initial condition, which best fits the observations. There are many potential sources of uncertainties: the accuracy of the positioning of the HST, the accuracy of the coordinates of 2014 MU69 (remember: this is not a pixel, but a diffraction spot), the duration of the exposure… and also the location of the stars surrounding 2014 MU69 in the field of view. To make absolute astrometry, you need to know precisely the location of these stars, and you get their locations from a star catalogue. Currently, the astrometric satellite Gaia is making such a survey, with a never reached accuracy and comprehensiveness. The Gaia Data Release 2 has been released in April 2018, and gives positions and proper motions (i.e. you can now consider that the stars move from date to date) of more than 1 billion stars! The authors had the chance to use that catalogue. This resulted in predictions, which were accurate enough, to predict a stellar occultation, which has been observed from the Earth. When a Solar System body occultates a star, you can indirectly observe it. You observe the star with your telescope, and during a few seconds, the star disappears, and then reappears, because of this object, which light is too faint for you. Multiple observations of a stellar occultation give information on the motion of the object, and on its dimensions. The rings around Chariklo and Haumea have been discovered that way. For 2014 MU69 (or Ultima Thule), an occultation has been successfully predicted. It has been observed 5 times on 2017 July 17, in Argentina, giving 5 solid-body chords. This permitted us to infer that 2014 MU69 could be bilobal, or even a contact binary. And from these astrometric data, the authors propagated the orbit of 2014 MU69 over 100 million years, in considering the uncertainties on the initial positions. The outcomes of the simulations safely state that 2014 MU69 is on a very stable orbit, with a mean semimajor axis of 44.23 astronomical units (39.48 for Pluto), and an orbital eccentricity smaller than 0.04. This results in an orbital period of 294 years, during which the distance to the Sun barely varies. We are looking forward for the encounter in 6 months! and the Wikipedia page of S. Alan Stern. Hi there! I will present you today a fascinating paper. It aims at a comprehensive understanding of the system composed of an asteroid, (107) Camilla, and its two satellites. For that, the authors acquired, processed and used 5 different types of observations, from all over the world. A consequence is that this paper has many authors, i.e. 27. Its title is Physical, spectral, and dynamical properties of asteroid (107) Camilla and its satellites, by Myriam Pajuelo and 26 colleagues, and it has recently been published in Icarus. This paper gives us the shape of Camilla and its main satellites, their orbits, the mass of Camilla, its composition, its spin period,… I give you these results below. We have of course other data, which have been improved by the present study. Please by a little patient. In 2001 the Hubble Space Telescope revealed a satellite of Camilla, S1, while the second satellite, S2, and has been discovered in 2016 from images acquired by the Very Large Telescope of Cerro Paranal, Chile. This makes (107) Camilla a ternary system. Interesting fact, there is at least another ternary system in the Cybele group: the one formed by (87) Sylvia, and its two satellites Romulus and Remus. Since their discoveries, these bodies have been re-observed when possible. This resulted in a accumulation of different data, all of them having been used in this study. You record optical lightcurves in measuring the variations of the solar flux, which is reflected by the object. This results in a curve exhibiting periodic variations. You can link their period to the spin period of the asteroid, and their amplitudes to its shape. I show you an example of lightcurve here. High-angular-resolution imaging requires high-performance facilities. The authors used data from the Hubble Space Telescope (HST), and of 3 ground-based telescopes, equipped with adaptive optics: Gemini North, European Southern Observatory Very Large Telescope (VLT), and Keck. Adaptive optics permits to correct the images from atmospheric distortion, while the HST, as a space telescope, is not hampered by our atmosphere. In other words, our atmosphere bothers the accurate observations of such small objects. A spectrum is the amplitude of the reflected Solar light, with respect to its wavelength. This permits to infer the composition of the surface of the body. The high-angular-resolution spectrum were made at the VLT, the resulting data also permitting astrometry of the smallest of the satellites, S2. These spectrum were supplemented by near-infrared spectroscopy, made with a dedicated facility, i.e. the SpeX spectrograph of the NASA InfraRed Telescope Facility (IRTF), based on Mauna Kea, Hawaii. Infrared is very sensitive to the temperature, this is why their observations require dedicated instruments, which need a dedicated cooling system. Finally, stellar occultations consist to record the light of a star, which as some point is occulted by the asteroid you study. This is particularly interesting for a faint body, which you cannot directly observe. Such observations can be made by volunteers, who use their own telescopes. You can deduce clues on the shape, and sometimes on the presence of a satellite, from the duration of the occultation. In comparing the durations of the same occultation, recorded at different locations, you may even reconstruct the shape (actually a 2-D shape, which is projected on the celestial sphere). See here. And from all this, you can infer the orbits of the satellites, and the composition of the primary (Camilla) and its main satellite (S1), and the spin and shape of Camilla. All of these observations permit astrometry, i.e. they give you the relative location of the satellites with respect to Camilla, at given dates. From all of these observations, you fit orbits, i.e. you numerically determine the orbits, which have the smallest distances (residuals), with the data. This is a very tough task, given the uncertainty of the recorded positions. For that, the authors used their own genetic-based algorithm, Genoid, for GENetic Orbit IDentification, which relies on a metaheuristic method to minimize the residuals. Many trajectories are challenged in this iterative approach, and only the best ones are kept. These remaining trajectories, designed as parents, are used to generate new trajectories which improve the residuals. This algorithm has proven its efficiency for other systems, like the binary asteroid (22) Kalliope-Linus. In such cases, the observations lack of accuracy and many parameters are involved. You can deduce the mass of (107) Camilla from these numbers, i.e. (1.12&pm;0.01)x1019 kg. The ratio of two orbital periods probably rule out any significant mean-motion resonance between these two satellites. This table gives two solutions for the shape: a spherical one, and an ellipsoid. In this last solution, a, b, and c are the three diameters. We can see in particular that Camilla is highly elongated. Actually a comparison between the data and this ellipsoid, named the reference ellipsoid, revealed two deep and circular basins at the surface of Camilla. Moreover, a comparison of the relative magnitudes of Camilla and its two satellites, and the use of the diameter of Camilla as a reference, give an estimation of the diameters of the two satellites. These are 12.7&pm;3.5 km for S1 and 4.0&pm;1.2 km for S2. These numbers assume that S1 and S2 have the same albedo. This assumption is supported for S1 by the comparison of its spectrum from the one of Camilla. In combining the shape of Camilla with its mass, the authors deduce its density, which is 1,280&pm;130 kg/m3. This is slightly larger than water, while silicates should dominate the composition. As the authors point out, there might be some water ice in Camilla, but this pretty small density is probably due to the porosity of the asteroid. and the website of Julien H. Girard. Hi there! I guess most of you have heard of Enceladus. This mid-sized icy satellite of Saturn arouses the interest of planetologists, because of its geological activity. Permanent eruptions of plumes, essentially made of water ice, have been detected at its South Pole, by the Cassini spacecraft. The study I present you today, Spatial variations in the dust-to-gas ratio of Enceladus’ plume, by M.M. Hedman, D. Dhingra, P.D. Nicholson, C.J. Hansen, G. Portyankina, S. Ye and Y. Dong, has recently been published in Icarus. Enceladus orbits around Saturn in one day and 9 hours, at a mean distance of 238,000 km. It is the second of the mid-sized satellites of Saturn by its distance from the planet, and is in an orbital 2:1 resonance with Dione, i.e. Dione makes exactly one revolution around Saturn while Enceladus makes 2. This results in a slight forcing of its orbital eccentricity, which remains anyway modest, i.e. 0.005. Like our Moon and many satellites of the giant planets, Enceladus rotates synchronously. 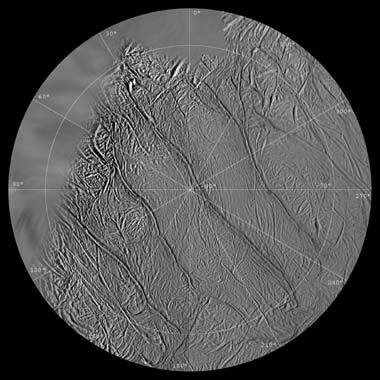 Interestingly, the Cassini spacecraft detected geysers at the South Pole of Enceladus, and fractures, which were nicknamed tiger stripes. They were named after 4 Middle East cities: Alexandria, Cairo, Baghdad, and Damascus. These 4 fractures are 2km-large and 500m-deep depressions, which extend up to 130 km. The plumes emerge from them. Interior models suggest that the source of these geysers is a diapir of water, located at the South Pole. Analysis of these plumes require them to be illuminated, and observed with spectroscopic devices. This is where the instruments UVIS and VIMS get involved. The study I present you today presents an analysis of VIMS data, before comparing the results of the same event given by UVIS. UVIS and VIMS are two instruments of the Cassini mission, which completed a 13-years tour in the system of Saturn in September 2017 with its Grand Finale, crashing in the atmosphere of Saturn. It was accompanied by the lander Huygens, which landed on Titan in 2005, and had 12 instruments on board. Among them were UVIS and VIMS. And then, you wonder, dear reader, whether I will introduce you UVIS and VIMS, since I mention them since the beginning without introducing them. Yes, this is now. UVIS stands for Ultraviolet Imaging Spectrograph, and VIMS for Visible and Infrared Mapping Spectrometer. Their functions are in their names: both analyze the incoming light, UVIS in the ultraviolet spectrum, and VIMS in the visible and infrared ones. And the combination of these two spectra is relevant in this study: the analysis in the ultraviolet tells you one thing (quantity of gas), while the analysis in the infrared gives the quantity of dust. When you compare them, you have the dust-to-gas ratio. Of course, this is not that straightforward. First you have to collect the data. As I said, the plume needs to be illuminated. And for that, you have to position the spacecraft where the plumes occult the Sun. So, this could happen only during a fly-by of Enceladus, which means that it was impossible to have a permanent monitoring of these plumes. Moreover, from the geometry of the configuration, i.e. location of the plume, of the Sun, of the spacecraft,… you had the data at a given altitude. It is easy to figure out that the water is more volatile than dust, is ejected faster, and higher… In other words, the higher is the observation, the lower the dust-to-gas ratio. The studied occultation happened on May 18, 2010, and lasted approximately 70 seconds, during which the illuminated plumes originated from different tiger stripes. This means that a temporal variation of the composition of plumes during the event means a spatial variation in the subsurface of the South Pole. The altitude was 20-30 km. But detecting a composition is a tough task. Actually the UVIS data, i.e. detection of water, were published in 2011, and the VIMS ones (detection of dust) only in 2018, probably because the signal is very weak. The authors observed a Solar spectrum in the infrared, and at the exact date of the occultation, a slight flux drop occurred, which was the signature of a dusty plume. For it to be exploitable, the authors had to treat the signal, i.e. de-noise it. After this treatment, the resulting signal was an optical depth in 256 spectral channels between 0.85 an 5.2 microns. You then need to compare it with a theoretical model of diffraction by micrometric particles, the Mie diffraction, to have an idea of the particle-size distribution. Because the particles do not all have the same size, of course! Actually, the distribution is close to a power law of index 4. And here is the results: at an altitude of around 25 km, the authors have found that the material emerging from Baghdad and Damascus are up to one order of magnitude, i.e. 10 times, more particle-rich than the ones emerging from Alexandria and Cairo sulci. It is not straightforward to draw conclusions from this single event. Once more, a permanent monitoring of the plumes was impossible. Spatial variations of the dust-to-gas ratio at a given altitude could either mean something on the variations of the dust-to-gas ratio in the subsurface diapir, and/or something on the spatial variations of the ejection velocities of dust and gas. Once more, the ratio is expected to decline with the altitude, since the water is more volatile. We dispose of data from other events, for instance a fly-by, named E7, which occurred in November 2009, of the South Pole at an altitude of 100 km, during which the Ion and Neutral Mass Spectrometer (INMS) analyzed the plumes. The data are pretty consistent with the ones presented here, but the altitude is very different, so be careful. You can find the study here if you have access to Icarus, otherwise you can get it freely on arXiv, thanks to the authors for sharing! A preliminary version, presented during a conference, can be found here. This is only a 2-page version, but once more it is free. and the one of Anya (Ganna) Portyankina.